Now this is one congregation I wouldn’t hesitate to join. 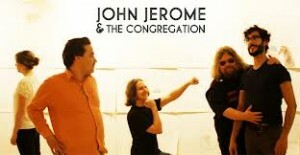 This Moncton quintet may be newly formed but you would never know it as John Jerome an the Congregation took me by surprise when they took the usually overdone vintage rock vibe to a whole other level. Absolutely brilliant. John Jerome’s voice is a perfect fit and the addition of the mandolin to certain tracks is what makes this album special and unique. Just when you thought you heard the best song on the album the next one comes on and makes you sit back and say “oh man”. Ask Not What I Can Do For You, But What We Can Do Together is released March 12, 2013 and it’s a disservice to yourself if you don’t pick one up. « Instant Breakfast: February 15 – Motherhood, Waking Night with Cancer Bats, Pharaohs, and Hero’s Last Rite!